The first expansion pack of Diablo III is coming on the way: Reaper of Souls. This new expansion is said to be released on March 25, 2014, will be developed for PC and Mac, as well as console versions. Diablo 3: Reaper of Souls will come with new features, including a numbers of additional features to the core of this game. A new character class will appear, the Crusader, specializes in defensive play, large weapons, and holy magic. A fifth Act is added, along with a new "Adventure Mode", which allows players to roam the entire world and take on random bounties and dungeons. The level cap will be 70 in Diablo 3 RoS. With unlocking the new level, players can enjoy new skills, runes, and passive abilities for all characters. 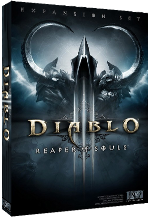 Now we offer the newest, legal, safe and cheap Diable 3: Reaper of Souls CD Key for you to have a much more interesting gameplay. Get into it with no regret. We will send you the key via email in 20 minutes as soon as your order is confirmed.